I have been in business for quite a while as you can tell by the grey hair. But I’ve also seen in this modern world of internet marketing, a lot of people chasing goals and chasing dreams. Now many many of you write in and email me. And you can email anytime you like. My email is jon@marketingforowners.com and yes, I answer every one. Yes, I do it myself. So you can ask me anything or tell me anything if you don’t like me. You can tell me that as well, I’ll still answer you and thank you for your opinion. But a lot of people are chasing dreams. They want the quick magic business. They’ve read too much about what is possible. So there’s a lot to this. Now for one, when you read about Facebook and you read about google and you read about other businesses that are doing great things and are making lots of money and it doesn’t appear to be that difficult because its online. What you have not heard is their failures and their struggles and the hours they’ve put in to it and how they built a company with no money. You also read about how they got the money, in fact you have seen some of that on Facebook, if you saw the movie, The Social Network, but it was very early on. But what we forget, we get very envious of these businesses but we forget that they struggle the same as you and I. There are millions upon millions of businesses in the world and hardly any of them, I mean wouldn’t even register as something of a percent, are going to be like those dream businesses. Now also, as you’re online you will find that a lot will promise great things, they will teach you how to make lots of money in the shortest possible time with the least possible effort. In fact they’ve possibly got a course for it or an e-book for it or a better software that would do it. Now I’m going to, if you don’t already realize and you’re suspicious, I’m going to tell you as it is. Those don’t work. They do not work. It’s the same with tips for stock markets, if you work brilliant on the stock market, you had guaranteed tips, you will invest your own money, you wouldn’t tell anyone else because that’s when it affects it. You do it yourself, it would make more money, you’d invested more you’ll do it more. Those that are selling tips don’t make tons of money themselves other than by selling the tips to you, because then it doesn’t matter. Have you ever heard of Photoshop? It’s pretty good. Anything can be made in Photoshop. And no they don’t do it themselves, they pay Photoshop experts. It can all be manipulated and yes a lot of it is. Just assume it is. So think back in your business and think long term. Now Dan Sullivan of Strategic Coach has talks in terms of 25 years. And consider that when he wrote that, he was 70, okay. In fact a bit after but he’s at 70, so he’s talking of a period from being 70 to 95. When all his staff are wondering, because he makes tens of millions, okay and in coaching he only works half the year. So he could retire, his staff were wondering but no he came up with a 25 year plan and he makes it easier by saying, think of it in quarterly goals, 3 months. But in 25 years, you’ve got 100 quarters. So you don’t have to do it all now. Because of course we all are getting the new shiny, this idea coming in left right and center. But we can’t do it all in one go. We need to slow down, we need to take a step back, take a deep breath and look longer term. 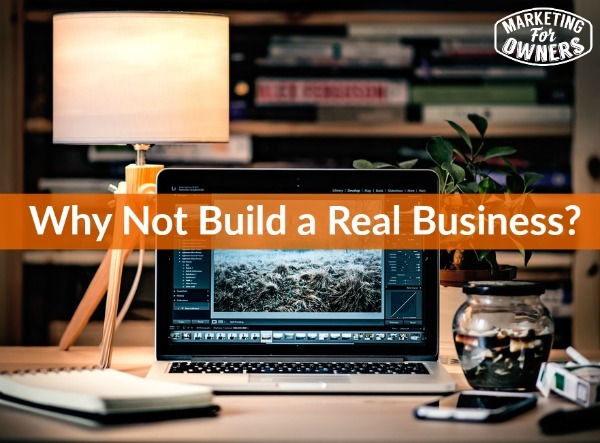 Build a real business, don’t build something that’s quick and fast and now. And yeah, I know some of you are thinking, ‘Yeah, but I am not going to build it, I am going to sell it.’ Well that doesn’t always work. You need to be in San Francisco really in a Silicon Valley to build software that has the potential for someone to come and buy it, before you run out of money and go bankrupt. And that’s what it is. Now again you only read about the ones that succeed. Those, if you look on the bios of those people, they quite often have 5,6 or 7 previous businesses like that, that failed, you’ve never heard of nor has anyone. And the reason is because it failed. Alright that is the way it is for most of us. So build a business, don’t build something short term, don’t aim for 1, 2, 3 years. You may be in your twenties, you may be in your thirties, you may be in your forties, say if you are 40 years old, it’s going to be 25 years until you are 65. Are you building something that is going to be finished and you are going to be done in 5 years and you are going to build another one. And then you’re going to sell it. And then you are going to build another one or you’re thinking you’re going to get millions each time you sell it, until you won’t need another business? Well I’ll tell you something else, if you are like that and if you are clever, you will want to build another one. You won’t be able to stop, you can’t just turn it off and go gardening and swimming or lying on the beaches. Your brain will be thinking of ideas and you’ll do it again. Then you’ll get a bit bored of doing this and you’ll get a bit bored of contacting your old friends who got hired by you and then got fired by people who bought your company. So, see what I mean. Think long term. Build a foundation. You know Sam Walton of Walmart, he only started building his business in big scale not long ago in the middle of the century, middle of last century. You think it’s been going a couple of hundred years or a hundred years. No it hasn’t. It’s very very quick. Tescos in the UK, only got big back in the 80s and 90s. Up till then were middling, they were big but they were just in the middle. It can be done at any time but Sam Walton, I think he died when he was about 97. On his death bed he was still giving out instructions about and still planning for a meeting that he was going to attend following week. Even though he died the next day. That’s as it is. Build a business. Alright, that’s what I am going to say on that. If you want to talk more to me about this, please email me, if you really wanted, I’d jump on skype and I’ll chat to anybody. Because I like my listeners. It’s very very clever and it’s really fast. Just enter in, you may see fire extinguishers, just go and enter in fire extinguishers and see all the variations of the term fire extinguishers that come up because you never end of ideas of what to write about. And this is based on what people are searching for. All over the internet. That’s my tip for the week. And next thing is tomorrow is another one in our expert interview series. The Wednesday interview series is always good. I’ll catch you again soon.